These exciting CDs are dramatic, word-for-word narrations from the KJV or NIV, using the art of storytelling and incorporating carefully chosen music and sound effects. The Raising of Lazarus, John 11. The latest CD in the series, "Defeating Giants," is now available! We have been waiting many years to get this next CD. It features the exciting stories of "David and Goliath", "Namaan the Leper", "Gideon", "Micaiah the Prophet and Jehoshaphat the King" and "The Sacrifice of Isaac! 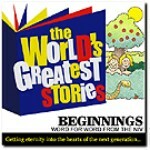 These exciting CDs are dramatic, word-for-word narrations from the KJV or NIV, using the art of storytelling and incorporating carefully chosen music and sound effects. Choose which version you want, KJV or NIV. These exciting CDs are dramatic, word-for-word narrations from the KJV or NIV, using the art of storytelling and incorporating carefully chosen music and sound effects. Includes the Battle of Jericho (Joshua 1:1-6:27) and the Book of Esther. Recorded in NIV or KVJ.